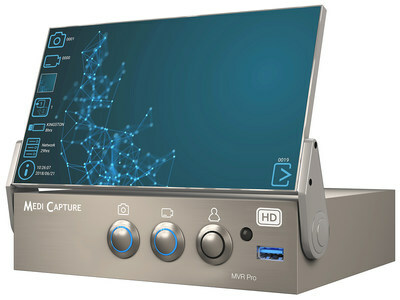 PLYMOUTH MEETING, Pennsylvania, June 28, 2018 /PRNewswire/ — MediCapture®, a global provider of medical video recorders, announced that its new MVR Pro HD medical video recorder is now commercially available with first shipments beginning in the 3rd quarter. This new state-of-the-art recorder is part of a series of advanced recorders that will launch throughout 2018, offering hospitals and surgery centers unique features that will elevate how surgical procedures are recorded and stored for post review. As with all recorders in the MVR Pro Series, the MVR Pro HD comes with a handy built-in touch screen featuring intuitive icons. The icons also display when connected to external touch-screen monitors, making the recorder both versatile and easy to use. The advanced network connectivity, including WiFi and Bluetooth, makes it easy to access and retrieve patient information and to transfer and store video files. A DICOM option will be available soon, and a 4K Ultra HD alternative will follow. "This represents a major step forward in medical video technology," said Mike Bishop, CEO of MediCapture. "Never before has there been a series of medical recorders that incorporates all the latest technological advancements, yet still has the flexibility and scalability to address the visualization needs of today’s modern operating rooms, all while maintaining the ease of use for which MediCapture products are known." Bishop said that each recorder in the series is powered by the exclusive iMave® Pro Platform, an Integrated Medical Archiving Video Engine for next-generation OEM camera systems and medical devices. Other MVR Pro recorders with 4K Ultra HD and DICOM will be launching throughout the year. Demonstrations of products are available by calling 1-888-922-7887. MediCapture, Inc. is the industry leader in the design and manufacture of medical video recording solutions. MediCapture’s easy-to-use recorders save high definition video and images directly to a USB flash drive, local hard drive, or network drive. The recorders work with virtually any medical video device including endoscopes, arthroscopes, surgical microscopes, ultrasounds, C-arms, and more. MediCapture also offers medical video recording solutions to OEMs and integrators. For additional information, call (888) 922-7887, or visit medicapture.com; LinkedIn.com/medicapture.